This month’s round up has a few stories of Transition groups working on energy efficiency, fuel poverty and renewable energy. Wilmslow and Worthing have been planting orchards. Other news from Canada, Ireland, Holland and Portugal. From September to December 2011, 12 voluntary writers and a voluntary editor from different Transition initiatives committed to collaboratively writing a group blog and publishing a new story every day. For them this was one post per fortnight. For the editor it was seven days a week. Together they produced an extraordinary and honest account of life in Transition; the ups and downs, the thrills and the disappointments, the challenges of swimming against the mainstream narrative’s current in an effort to re-set our cultural stories, help us all align to a more realistic worldview, and give back some pride to our local communities. This phrase articulates an age-old debate about the role of the arts in our society. The arts and Transition should be a perfect match. Are we there? For countless generations, ceilidhs have been at the heart of Celtic life. Art as a tool to bring across history’s lessons to the next generations should not be underestimated. Transitioning into an unknown future has got to be about creativity. We must let our imaginations run loose to create new ways of living, new types of energy and new games to play. It’s dark outside and I can hear the wind threshing the trees across the road. I’ve been thinking a lot about the uselessness of polemic thinking. In the UK, 0.3% of people own 67% of all the land in the country. Charlotte Du Cann looks back over the 3 month Social Reporting pilot showing some of the workings behind this pilot and what made it a success. To start the year Transition-style we are having a month of Pausing for Reflection and Visioning ahead. In these first two weeks we’ll be looking back at our 3 month pilot and selecting some of its most striking posts and republishing one of them each day. Tough call! Because there were many brilliant ones. This one sentence provided the electric jolt to remind me about the importance of our conversation, for without that conversation there is nothing. Like most other people, I just want to stay under the duvet. ‘In Transition 2.0’ is nearly ready to be unveiled to the world! It draws together stories from around the world showing Transition initiatives at the various stages of transitioning their communities. In order to be able to feature some of the stories from overseas, they ran a crowd-funding process which raised the money required. An international team of volunteers have translated the film in 18 languages. Also, in spite of telling stories from around the world, no-one set foot on an aeroplane in order to make this film, local camera-people being enlisted to film each sequence, making this one of the lowest-carbon international films ever produced. In early February, each of the initiatives whose stories are told in the film have been invited to host a preview. The premiere of ‘In Transition 2.0’ will be at a high profile event in late March (still under wraps). The DVD will be released around the time of the premiere. DVD of the 22 min film including screening license costs £5.00 plus any P&P. How well is your Transition Initiative going? What can you do to take your Transition Initiative to the next level? 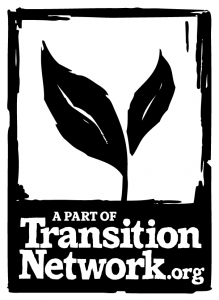 On 28-29 January in Bath, Transition Network will be holding its second Transition THRIVE training. We have designed this 2-day course to help existing Transition Initiatives take stock, identify their main barriers to sustaining momentum and develop strategies on how to move forward. Through case stories of other Transition Initiatives, group work and discussions, this training addresses each participant’s needs. It will offer practical advice on topics such as creating jobs in a local, green economy and could some of some the really inspiring examples of social enterprises work in your initiative. The training will be run by Naresh Giangrande, co-founder of Transition Town Totnes and Transition Training, and Jenny Mackewn a senior lecturer at Bath University and member of Transition Bath. The Woodland Trust want to find out if there are any Transition groups actively engaged in or contemplating projects involving woodlands. Co-operatively-owned energy generation is a vibrant and growing sector in the UK. The first co-operatively-owned wind turbines, Baywind in Cumbria, started turning in 1997. Since then, over 7,000 individual investors have ploughed over £16 million into community-owned renewable energy. This report summarises insights gained from visits to five co-operatively owned energy projects during the summer of 2011. Conflict in TI groups; UK Localism Act – have your say; Garden and Household Tool Co -operative -any advice?